Fort Garland is a very small town, the first one you will encounter as you enter into the San Luis Valley from Highway 160 over La Veta Pass. It is home to one of the best museums in Southern Colorado. The town is named after New Mexico Department commander Brevet Brigadier General John Garland. The purpose of Fort Garland was to protect nearby settlers from the Ute Indians. It replaced Fort Massachusetts which was located six miles to the north. During the Civil War, Colorado Volunteers, who had trained at Fort Garland, were sent south through harsh winter conditions to join the New Mexico Volunteers. Their job was to fight the Confederates at the Battle of Glorieta Pass. This stopped the soldier’s efforts to bring the Civil War to the far West. The famous Buffalo Soldiers were stationed in here between 1876 and 1879 after having served in Texas. In 1879, the Meeker Massacre occurred in northwestern Colorado when the Ute Indians killed agent Nathan Meeker and his employees. To help better protect the settles, Fort Garland became the base of operations against Indians. When the Utes were removed to Utah, the troop’s numbers were reduced and in 1883 Fort Garland was officially abandoned. Today the museum houses five of the original buildings from when the Fort was first occupied on June 24, 1858. There were originally twenty-two buildings including a hospital. One of the buildings still remaining is the commandant’s quarters. This is where Kit Carson and his wife lived when he was stationed here. Another building that has been restored is the Calvary Barracks. This houses exhibits of traditional Hispanic Arts and artifacts from the 19th century. The museum also has artifacts that were used in everyday life at the fort. 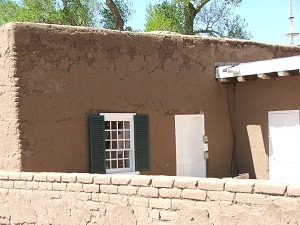 Most of the buildings were built out of adobe bricks. Adobe is a mixture of clay, sand, water, and straw. 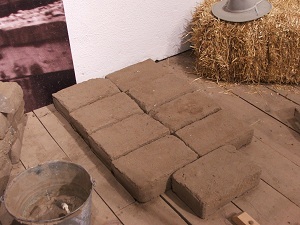 When mixed with the correct consistency it can be formed into bricks and used to build strong buildings. 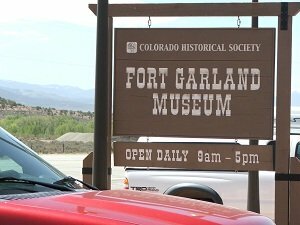 Admission to the Fort Garland Museum is $5.00/adult; $4.50/seniors 65 and older; and $3.50/child. The museum is open from 9 a.m. – 5 p.m. every day during the tourist season. We invite you to take a step back in time and learn about some of Colorado’s oldest history. This year I (Debbie) had the pleasure of attending the Fort Garland Museum over Memorial Day Weekend. 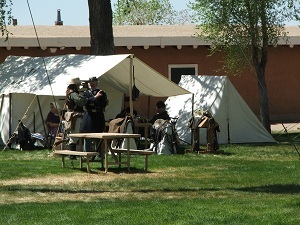 This is a special weekend for the museum as it hosts its annual encampment. 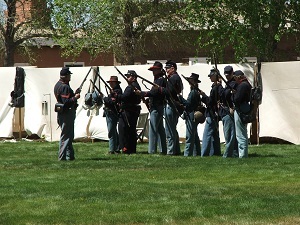 This is a gathering of men and women from Colorado, New Mexico, and Texas dressed in various types of military uniform to present a living history program. Each of the men in uniform welcomes you to ask them questions about their uniforms, weapons, history, etc. They love enacting the military personnel. I had a lesson given to me about the different types of canons which were on display. I learned that the barrels of the canons were made of bronze. Bronze was used instead of cast iron because it expanded more than the cast iron and is less dense in the making of the canon barrel. One of the canons had a beveled interior which made the canon ball shoot up to 2,000 yards with great accuracy. Another one of the canons had a smooth interior which would therefore shoot up to about 800 yards without the accuracy. It was great to have the lesson given by one of the encampment members. Just seeing his military dress uniform was amazing. 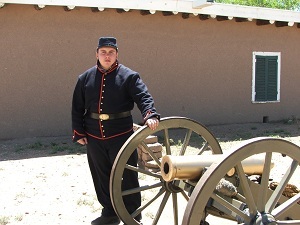 The Fort is well worth your stop and especially if it is during the weekend of the annual encampment. It took me back in time to see men in their military clothing with the tents set up around the parade grounds. Women and children were also there in their attire of the 1860’s. There was also many antique guns on display. 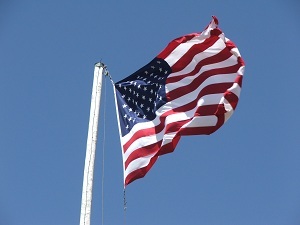 A ceremonial raising and lowering of the huge 36-star garrison flag was held at 9 a.m. and 5 p.m. each day of Memorial Day Weekend. What a tribute to our military both past and present.